Purple Magnolia Floral Design artistically creates whimsical floral designs for magical occasions. Reminiscent of The Secret Garden, Purple Magnolia’s designs bloom with layers of color, shape and structure. 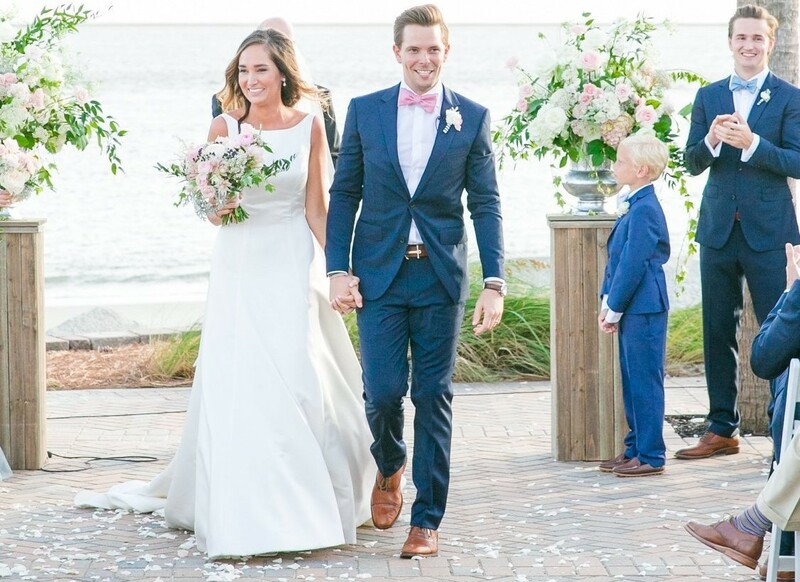 For Hilary and Duncan’s oceanfront wedding at Seabrook Island Club, Purple Magnolia artfully created the bride’s bouquet, bridesmaids’ bouquets, flower girl bouquets, flower crowns, boutonnieres, arrangements and garland using ranunculus, rice flower, roses, blushing bride protea, navy viburnum berries, astilbe, ivy and dusty miller foliage. “We loved the opportunity to provide the flowers for Duncan and Hilary’s wedding. We gave the ceremony and reception space a more ‘garden style’ by bringing in some larger ceremony arrangements, attaching garland to some of the ceremony chairs, and adding smilax to the reception chandeliers. The flower crowns for the younger flower girls were some of our favorites to make. The view at the Seabrook Island club is gorgeous, and we love the opportunity to add floral accents to this beautiful space,” said Owner and Principal Designer Ann Cunniffe. In business since 2016, Purple Magnolia Floral Design specializes in natural, romantic, garden-gathered flowers for weddings and special events in Charleston and surrounding towns. Ann works closely with brides and grooms, guiding them through every step of the floral design process. She thoroughly enjoys showcasing locally grown flowers, taking inspiration from nature, and adding a touch of foraged materials for richness and texture. To connect with Purple Magnolia Floral Design, please feel free to visit http://www.thepurplemagnolia.com, email ann@thepurplemagnolia.com or call (843) 670-6142.